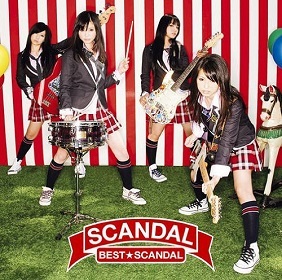 Best ★ Scandal is the debut studio album from all-female Japanese pop-rock band SCANDAL. It was released in three versions with different covers: the regular CD only version, a limited version that consists of CD with DVD, and a collector's edition consist of a CD and a coffee table book (photobook). SCANDAL BY SCANDAL is a 284-page coffee table book that features photos of the band members taken by the band members themselves. The album reached number 5 on the Oricon weekly charts and charted for 21 weeks. This making them the first girl band since Zone to have a debut album chart in the top five. One of the song, Doll, is their major single debut released in October, 2008 under Epic Records Japan. With this album, Scandal embarked on their Scandal First Live: Best Scandal tour in 2009. And by end of that year, SCANDAL become runner up of Best New Artist Award at the 51st Japan Record Award, lost to famous Korean boyband BIG BANG.